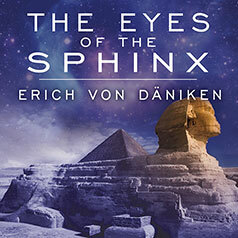 The Eyes of the Sphinx, Erich von Daniken's follow-up to his worldwide bestseller Chariots of the Gods, reveals more startling evidence that ancient Earth had contact with aliens. —Research showing that the location and design of the pyramids were uniquely fit for preservation—something the Egyptians couldn't possibly have known. —Remains of the ships built by the Pharaohs and buried with them for travel in the afterlife—imitations of the ships they saw used by men from the sky. —The most recent discoveries—hidden chambers and passageways, one of which ends at an ancient door. And behind the door is...the unknown. —Prehistoric bones that prove the existence of a worldwide cult that deformed children's skulls in imitation of the "gods" they had seen. —New interpretations of ancient writings—and new speculations on ancient mysteries.